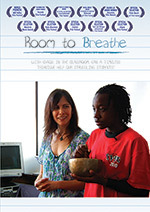 Room to Breathe DVD is available for home and community screenings. Host a small screening in your home to help inspire meaningful discussion and action among parents, neighbors and friends (up to 25 people). Engage your community with a screening at a local school, community center or other setting, with permission to charge admission or request donations (up to 50 people). Engage your community with a screening at a local school, community center or other setting, with permission to charge admission or request donations (more than 50 people). If you have other ideas or wish to hold multiple screenings, please inquire with us -- roomtobreathefilm[at]gmail[dot]com.